"The most beautiful riling that has ever been found m Fgypt". After six years of intense excavation work in the Valley of the Kings, the archaeologist Howard Carter had finally stumbled on the entrance to a tomb. 1 he tomb of Tutankhamen? He did not know for certain, but he sent the above telegram to his patron, Lord George Edward Carnarvon, imploring him to come to Egypt as quickly as possible. 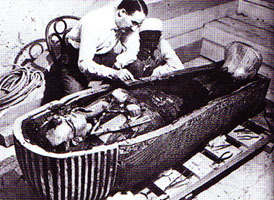 Carter recovered the tomb and awaited Lord Carnarvon's arrival — a period of almost three weeks in which Carter was sleepless with excitement. Carter and Carnarvon experienced one of the greatest triumphs in the history of archaeology: after they had cleared the last of the sixteen steps leading into the tomb, the two were standing in front of a walled-up entrance — bearing the royal emblem of Tutankhamen! This was only the beginning. When Carter and Carnarvon found a second walled-up entrance, they took a crowbar and knocked a hole m the 3,000 year-old masonry. Through it, they gazed at things that left them speechless. The flickering light of a candle illuminated the most important treasures ever discovered in Egypt. 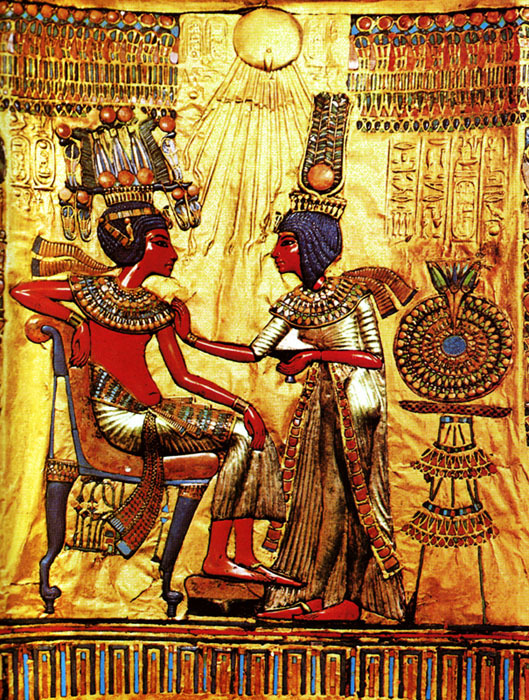 Among them was a gold throne with a brilliantly coloured back — a present to the young Pharaoh from his wife. 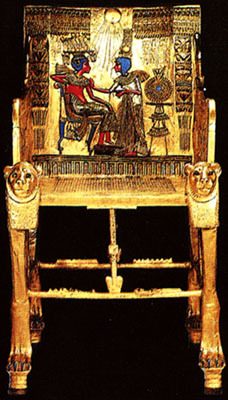 Carter described the chair as "the most beautiful thing that has ever been found in Egypt". These objects captured the world's attention and sparked a lasting interest in Egyptian art. It was as if a tale from A Thousand and One Nights had come true, and Carter summarised his find in this way: "The most remarkable thing Tutankhamen did in the eighteen years of his reign was to die and be buried." The press gave the story extensive coverage. It also invented another story — on something it called the "Pharaoh's Curse", which was apparently deadly to anyone who disturbed the rest of the dead king. It is true that Lord Carnarvon and his wife died shortly after the tomb's discovery, as well as a number of others who had been present when it was opened. 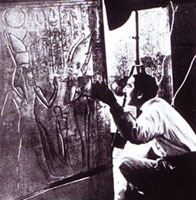 And by 1930 the only living member of the original excavation team was Howard Carter, who seemed indifferent to the rumour that these deaths were the result of an ancient malediction. After all, they had never encountered an inscription recording the "Pharaoh's Curse". Upon investigation into this series of deaths, it was discovered that quite a few were press swindles invented to keep newspaper circulation high. Yet there is something to the legend. Science has revealed that by opening these tombs, people are exposed to an infectious mould which is present in decaying bodies. This may have something to do with the mysterious series of deaths that followed the discovery of Tutankhamen's tomb.